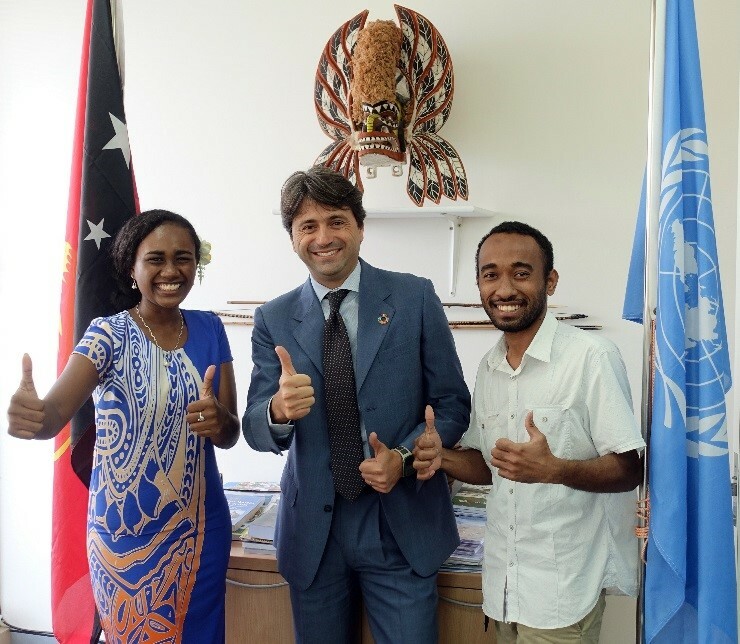 Two young people from Papua New Guinea will travel to the United Nations Headquarters in New York next week to attend the Economic and Social Council (ECOSOC) Youth Forum, taking place between 8th and 9th April 2019. The Youth Forum is an annual platform through which youth from the Member States contribute to policy discussions at the United Nations. The United Nations in Papua New Guinea is supporting the participation of Ms Leoshina Kariha, who is the 2019 UNICEF Youth Advocate, along with Mr. Kim Allen, an avid youth advocate in his community. During the Forum, youth representatives from around the world will discuss, share ideas, and think together about what they can do to advance the 2030 Agenda for Sustainable Development, the Addis Ababa Action Agenda, and the Paris Climate Agreement. They will take part in brainstorming sessions, interactive speaker panels and discussions with Member States on the theme, “Youth: Empowered, Included and Equal”. The Forum provides an important platform for the youth from Papua New Guinea and around the world to exhibit their commitment and innovative solutions to development challenges and to share their valuable experience with peers. Ms Kariha, 18, was the youngest of six finalists when crowned Miss Pacific Islands in Tonga in December 2018. During the two-day pageant she secured the titles of Best Talent, Best Interview and was awarded Miss Tourism and Miss Personality. She is pursuing a Bachelor of Arts at the Divine World University in Madang Province and says she would like to serve the country as a diplomat or social worker. Ms Kariha was also the youngest of all contestants when she won the Miss PNG Crown in November 2018. Both youth representatives have already been actively participating in youth forums to share Papua New Guinea’s voice with the world. Mr Kim Allen is a member of the Commonwealth Youth and Gender Equality Network and was selected last year as are presentative from PNG to attend a Gender Equality Training in Sri Lanka. Kim has been involved in conducting Essential UN outreach programmes in schools across Port Moresby to raise awareness on the Sustainable Development Goals. “Thank you to the United Nations PNG forgiving both Kim Allen and I this opportunity to participate in ECOSOC 2019, a prominent global forum. We will do our best to represent the collective voice of our youths across the nation. I thank also UNICEF for my recent appointment as a youth advocate role, a great honor and challenging responsibility to spearhead. I encourage other young people throughout the nation to take the initiative to contribute your say and actions to help initiate development in your individual communities at all levels of society. Our youth is vibrant and capable of making a positive impact on the development in our country. Change starts with one person and goal, willing to take that first step towards action,” stated Leoshina Kariha. The youth representatives are being financially supported by UNICEF and UNDP in Papua New Guinea to attend the ECOSOC Youth Forum. “Youth are key partners actors in bringing about positive change to the community and to the entire country. This is an opportunity for Leoshina and Kim to represent Papua New Guinea and engage meaningfully with other member states youth representatives on the implementation of the Sustainable Development Goals. By sending these inspiring and proactive young Papua New Guineans to this Forum, we will be exhibiting the country’s strong commitment and the greatest assets for the nation’s future,” commented Mr. Gianluca Rampolla UN Resident Coordinator in Papua New Guinea. Caption: Ms Leoshina Kariha, who has recently been designated as the 2019 UNICEF Youth Advocate, and Mr. Kim Allen, participants of the ECOSOC Youth Forum with UN Resident Coordinator Gianluca Rampolla (centre).